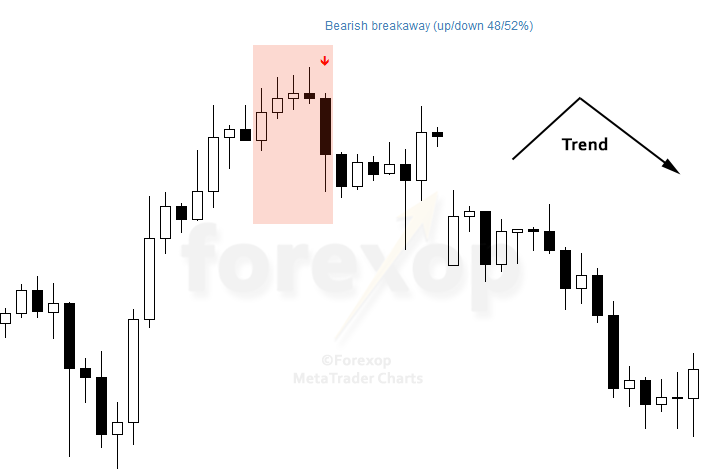 A bearish breakaway is a chart formation that can appear in a rising market when the price starts to pull or break away gradually to the downside. It suggests an overbought market. When it forms at a chart high it is seen by most traders as a bearish sign of a trend that’s topping out. The bearish breakaway is a formation of five candlesticks where the first is always bullish and the last is always bearish. The middle candlesticks will be rising and can be either bearish or bullish, but will usually be bullish. This is a complex pattern so it’s important to correctly classify the middle candlesticks and their positions with respect to the outer bars. The first inner bar should open at or above the close (top) of first bar. If it opens above, this means that the market has “gapped up” at the open. This is usually a sign of strong upwards momentum. Gapping between candlesticks is often seen in stock charts but is much less common in continuous markets such as forex. The tops and bottoms of the inner bars should be rising within tolerance so as to create a stair like appearance. Finally, the last bar is bearish and should close at least below the bottom line of the first inner bar. The whole configuration then forms a dome shape (see Figure 1). In some situations the last bar closes below the open of the first bar as in Figure 2. The last candlestick closes below the close of the first (a bearish engulfing pattern). Where the last of the inner candlesticks is a shooting star. Upwards momentum is strong during the first bar and carries through to the inner bars. But then the price surge starts to slow significantly as time goes on. The inner bars represent a market changing from bullish to bearish sentiment. On a daily price chart, the entire breakaway event last for five days. A bearish breakaway indicates an overbought market to some degree or another. But importantly this doesn’t always mean a downwards correction is imminent. As with all technical patterns the reliability of the formation differs greatly from chart to chart and across different time periods. The bearish breakaway can even sometimes be a contrarian indicator. For these reasons it’s important to look at all of the data and work-out the highest probability break direction before committing to trade. This also means filtering out the weaker patterns. We usually trade the bearish breakaway as a sell signal but like the bullish breakaway there are numerous different ways this can be done. The most popular one, that being trying to time the exact reversal of a bullish trend, is generally the most difficult. Bull and bear markets can often go on far longer than people expect. If you’ve ever tried you’ll know that timing the exact instant the market turns is especially hard. If we wrongly call the market top and sell, that can take the position into serious drawdown as the market continues to rise. The less risky technique is to trade in the direction of a down trend that’s already established. For an example see Figure 3. 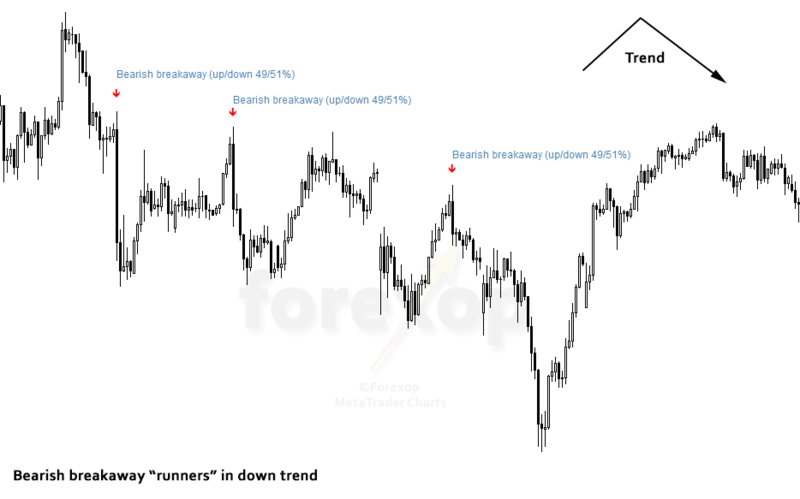 To do this what we try to do is to trade on breakaway runners using this indicator. This is a sequence of breakaway patterns that can appear in a down market. We commonly find these patterns forming at the tops of waves within the downtrend. Each wave is a failed bearish rally. These are normally limited in strength especially if there’s a strong and established bearish trend in place. Using a grid system the position amount can be increased only when and if the market moves in the required direction. This is done together with controlling stop losses carefully. If the market starts to break in the other direction then losses are much less than had we committed to the trade all at once. With longer duration charts, like the daily and four hourly charts, a helpful technique is to drill down into the lower time frames to examine the price action. A down trend can often be traded profitably using this method. 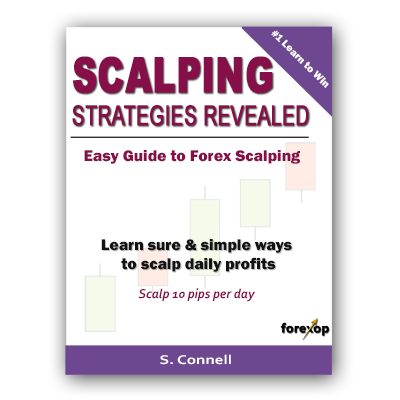 Essential for anyone serious about making money by scalping. It shows by example how to scalp trends, retracements and candle patterns as well as how to manage risk. It shows how to avoid the mistakes that many new scalp traders fall into. Yes. It clicked in my mind. I’ve always seen that after a big up trend a small down trend follow and vice versa. Bollinger bands can show this curve exactly. RSI too. Your article explain it very clearly. Thanks so much! I’ve already lost so much money learning these patterns and I’ll keep doing it and learning them. One day it’ll all pay off. Bearish Breakaway is one of the best tools to reflect bearish trend of market and by applying this technique, one can get some very practical data without any hassle. 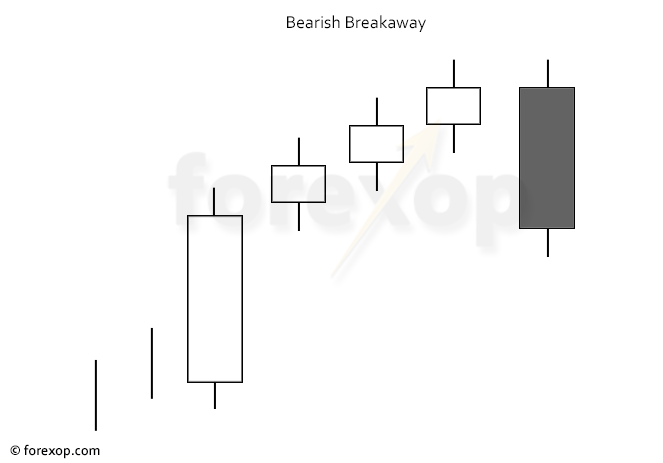 Bearish Breakaway is my personal favorite!